Max Planck. Public domain image from Wikimedia Commons. In a previous annotation I talked about black body radiation, why hot things glow with different shades of red, orange, or white, and gave a loose outline of the derivation of the Rayleigh-Jeans law. This is a theoretical model of the spectrum of a hot, glowing object, based on the laws of physics as they were understood around 1900. The Rayleigh-Jeans law works well for low frequencies (or equivalently, long wavelengths) of electromagnetic radiation, on the red side of the visible spectrum, but fails spectacularly for higher frequencies in the ultraviolet and beyond. The fact that the Rayleigh-Jeans law works so well for some observations indicates that it probably has some kernel of truth to it. But at the same time, the fact that it fails so dramatically indicates that the understanding of physics at the time had some serious flaw in it. Also, it wasn't the only mathematical description of black body radiation around at the time. In 1896 Wilhelm Wien had found an equation that described the intensity of black body radiation very well for high frequencies, but failed badly for low frequencies. The true spectrum of a black body followed Rayleigh-Jeans at low frequencies, then somewhere in the middle it deviated and headed towards what is now known as Wien's approximation. The behaviour in the middle was a complete puzzle. 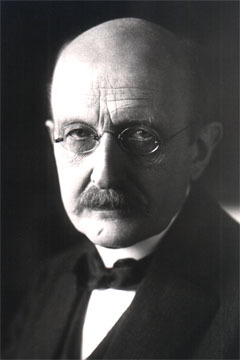 Max Planck was a physicist working at the University of Berlin. He too was puzzled by the spectra of black bodies and sat down to work out an equation that would describe the observed real-world spectra more accurately than Rayleigh-Jeans or Wien alone. In 1900, just a few months after Rayleigh and Jeans published their formula, he came up with one that was essentially a blend of the two former equations and that bridged the gap between them nicely, so that it fit the observations well at all frequencies. This was nice, but there was no theoretical basis for Planck's formula. To address this, Planck laboured over the next few months to come up with a derivation based on the known laws of physics. He began with something similar to the derivation of Rayleigh and Jeans (previously explained here), although Rayleigh and Jeans were in fact working on that derivation simultaneously and published it after Planck had finished his own. Planck's starting point was actually a derivation by Ludwig Boltzmann for the distribution of kinetic energy in a gas (the Boltzmann distribution). Boltzmann's work relied on counting numbers of particles with certain amounts of energy, and this was made easier by initially assuming that the energy could only appear in whole number multiples of some small value. After accumulating the statistics of a gas sample like this, Boltzmann considered how those statistics behaved as the small value tended towards zero, giving a continuous energy distribution. This approach gave him the correct result. 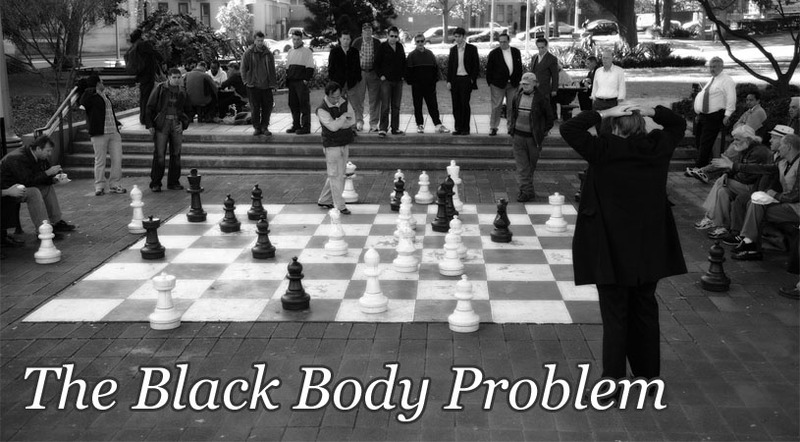 Planck adapted Boltzmann's approach to the distribution of radiation emitted from a black body. He assumed the radiation could only occur in whole number multiples of some small energy amount and calculated the distribution statistics based on this, then let the size of that small amount tend towards zero. And then he discovered an astonishing thing. Philipp Lenard. Public domain image from Wikimedia Commons. As this arbitrary small amount of energy grew smaller, Planck's calculated black body distribution approached the observed spectrum, not just at one end like Wien's approximation or the Rayleigh-Jeans laws, but all over. It took on the form of the equation he'd already worked out to fit the shape of the entire spectrum. Fantastic! But... Planck realised that as the small amount of energy got even smaller and approached zero (in other words, as the black body radiation energy distribution tended towards what he expected to be the real-world, continuous distribution), rather than the equation converging to the answer he hoped for, it instead went haywire, going wrong in much the same way as Rayleigh-Jeans. E is the small amount of energy, ν (the Greek letter nu, not a lower case V) is the frequency of the radiation, and h is a constant value that relates the two to each other. The value of h required to make Planck's derivation give the correct result is really, really tiny; so even when multiplied by the quite high frequencies of light or gamma rays, the amount of energy E is still very, very small by any human standards. Planck noted when he presented this work to the Deutsche Physikalische Gesellschaft that his derivation required that the energy of black body radiation be considered to be divided up into very small but discrete amounts. In other words, quantised - a term derived from the Latin quantus, the same root as the English word "quantity". To Planck, this was initially nothing more than a mathematical trick to get his derivation to work. It wasn't clear what, if anything, this quantisation of energy actually meant. In particular, Planck didn't think that the radiation emitted by a black body actually was quantised into small energy units - he thought it was a contiuous smooth distribution. Over the next few years, that word quantisation kept popping up. 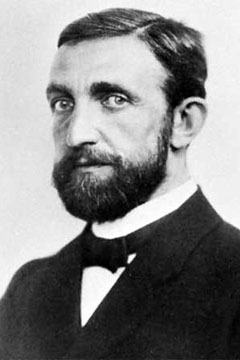 Philipp Lenard did experiments to confirm the findings of J. J. Thomson (who we met earlier) on the properties of his newly discovered electrons. Lenard referred to electrons as "quanta of electricity" - small, discrete packets of electrical charge. 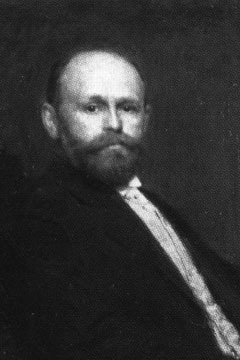 Wilhelm Hallwachs. Public domain image from Wikimedia Commons. Meanwhile, other physicists were working on a completely different problem. In 1887, Heinrich Hertz (who we met briefly at the end of this annotation on electromagnetic waves) had discovered that if you shine ultraviolet light on a metal electrode, it is able to produce measurably larger sparks of electricity when connected to an electric circuit than if there is no ultraviolet light. Hert's assistant, Wilhelm Hallwachs, investigated this further, finding that a piece of polished zinc with a negative electric charge loses its charge rapidly when exposed to ultraviolet light. Furthermore, if the zinc is initially neutral, exposing it to ultraviolet light gives it a positive electrical charge. The light was somehow causing negatively charged electrons to be ejected from the metal, regardless of what the initial charge was. The really interesting thing was that the rate of electron ejection depended on the intensity of the ultraviolet light, but that there was a sharp cutoff in electron ejection when the frequency of the light was changed. Below a certain frequency, nothing happened at all. Above that frequency, the effect switched on abruptly, at full strength. There wasn't any transition zone at all - the effect was completely absent at one frequency, and at a frequency just a tiny bit higher it happened just as strongly as any other (higher) frequency. This phenomenon was named the photoelectric effect. It was pretty clear that the energy in the ultraviolet light was transferring into the electrons on the surface of the metal, causing them to jump off. What was a mystery was the absolutely abrupt cutoff in light frequency. The light at frequencies either side of the cutoff was almost identical. Why would such a tiny change make such a huge difference? In 1902, Philipp Lenard (from three paragraphs ago) observed another strange effect involving ultraviolet light. Instead of metals, he was shining it on samples of gas in glass tubes, and finding that the light could ionise the gas - i.e. strip electrons off the gas molecules. And here the same curious cutoff occurred. Below a certain frequency - which was different to the one Hertz found for zinc - the effect simply didn't happen at all. Above the cutoff, it kicked in at full strength. Lenard also investigated metals more carefully, by placing them into vacuum tubes and shining ultraviolet light on to them. This allowed him to measure the energy of the ejected electrons. He expected that the more intense the ultraviolet light, the more energy the electrons would have. But he found this was wrong. The electrons always had the same amount of energy, no matter how intense the light was. All of these curious phenomena came to the attention of a man working at the Swiss Patent Office in Bern. That description alone is probably ringing bells for many of you. This man's name was Albert Einstein, and his work at the patent office involved examining patents related to electromagnetic technology. The subject fascinated him, and he read about the work of Hertz, Hallwachs, and Lenard, and the mystery of the photoelectric effect. The breakthrough came when he combined this with the seemingly unrelated work of Planck on black body radiation. Einstein decided that Planck's mysterious mathematical "trick" involving quantisation of energy must represent a real physical phenomenon. He suggested that the energy of light itself was quantised - that light came in little discrete packets, each of which contained exactly one unit of energy equal to Planck's hν. In other words, the energy of one of these single packets of light depends on the frequency of the light. The higher the frequency, the higher the energy. Albert Einstein. Public domain image from Wikimedia Commons. Applying this to the photoelectric effect, Einstein suggested that ultraviolet light below the frequency threshold simply didn't have enough energy per packet to kick out an electron. An electron in a metal or gas must require at least a certain amount of energy to be ejected. If the frequency of the incoming light is too low, then every single packet of light by itself doesn't have enough energy to do the job. And they can't combine energies, because they'd be hitting different electrons or at different times. But once you raise the frequency of the light above the threshold, then every single packet of light has enough energy to kick out an electron, and the photoelectric effect switches on in its full glory. There is no smooth transition as the energy goes higher - the amount of energy in each packet of light is either enough to kick an electron out, or not enough to do the job. This is a very neat explanation of all of the observations related to the photoelectric effect. 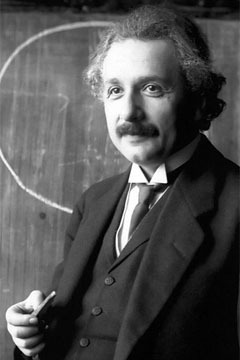 Although Einstein is more famous for his work with the theory of relativity, the citation for his 1921 Nobel Prize in physics reads "for his services to Theoretical Physics, and especially for his discovery of the law of the photoelectric effect". Which is not a bad thing, for the photoelectric effect is no small matter. Einstein published his explanation of the photoelectric effect in 1905. It was beautiful. It was elegant. It very neatly explained a raft of otherwise intensely puzzling real world phenomena. The problem was, according to Max Planck, that it was dead wrong. Light cannot possibly be quantised, Planck asserted. Light is a wave phenomenon, as so beautifully described by the electromagnetic equations of Maxwell. Everything about light makes sense if you view it as a wave of electricity and magnetism, propagating through space. In 1803, for crying out loud, over a century earlier than Einstein's ridiculous theory, Thomas Young had performed his definitive double slit experiment that proved beyond any shadow of a doubt that light propagated in waves. And waves, as everyone knows, can be produced with any quantity of energy, not restricted to arbitrary multiples of some fictitious "quantum" of energy! Well yes, countered Einstein. Everything about light makes sense if you treat it as a wave. Except the photoelectric effect. Light, said Einstein, has to be made of discrete "light quantum" packets. Planck dissented, but other physicists began looking very carefully at the implications of what Einstein had said. Einstein had taken an axe to this statement. Now, the floodgates were opened. Of course, multiples of a zero amount would be zero. What I'm really saying here is that the energy could be 1 or 2 or 3, for example, but not 2-and-a-half, or three-quarters. Last Modified: Friday, 31 January 2014; 14:33:09 PST.